The following study focuses on an ethnic group living in the Nuba Mountains of Sudan. Several ethnic groups share a common geography in Sudan’s Southern Kordofan Province, which en­compasses the approximately 50,000 km² wide Nuba Mountain range. The ethnic group of the Tima is one of the smaller societies of the region who live in the western area of the Mountains. There are over forty Nuba tribes inhabiting the Nuba Mountains and as many different languages. The number of the population of the Tima is estimated at approximately 7,000. The Tima are agriculturists cultivating mainly sorghum, millet, sesame, peanuts, tomatoes, okra, hibiscus, onions, and garlic. In private gardens, located close to , some mango, guava, and lemon trees grow as well. Furthermore, watermelons are cultivated on some fields. Before the war, when the market for cotton was still profitable, the Tima also grew cotton as a cash crop. Between 1987 and 2002, the region was a battle zone in the Second Sudanese Civil War and the area was continually devastated. After the Comprehensive Peace Agreement (CPA) was reached in 2005 and the final independence of South Sudan, international organizations invested in the region and some minor development started, but the future of the Nuba Mountains remains uncertain. Due to wars, instability, and the isolation of the area during the last decades, academic research has rarely been conducted and has only been possible within brief time spans. Consequently, the area of the Nuba Mountains has been fairly neglected by academic scholars compared to other areas within Sudan. 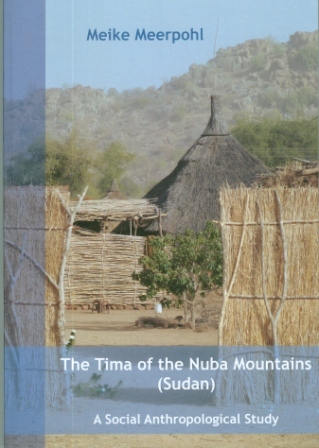 The ethnographic data presented here, collected between 2009 and 2011, con­tributes to the region’s study and to the social anthropological description of the Nuba Mountains. The study combines empirical ethnographic data collected during three field studies conducted in Khartoum and in the six villages of the Tima. Empirical data were collected in Arabic through semi-structured qualitative interviews, the collection of oral histories, participant observation, and multi-media documentation of places, rituals, ceremonies, dances, and games. For at least the last fifty years, the ethnic group of the Tima has undergone many cultural, reli­gious, social, and political changes. Many parts of Tima society, such as its language, its unique and characteristic cultural facets, including dances, songs and games, and its religious belief in the kajara as spiritual and social leaders are now extinct customs or on their way toward extinction. This ethnographic documentation therefore seeks to contribute to the study of the Tima during a very vulnerable political phase where future changes are unpredictable.